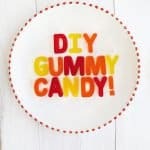 Make Your Own Gummy Candy! So, we are a little bit obsessed with gummy candy in my house. Well, by “we” I actually mean my husband who loves it enough for two, or maybe three, people. We had a candy table at our wedding reception and made sure it was well-stocked with all the gummy candy varieties necessary for the event. Recently I started wondering if it was possible to make my own gummy candy, or if it was the type of candy process that involves beakers, candy thermometers, and a physics degree from Harvard to figure out. I tested out a few of the easiest recipes I could find, and thankfully, it is totally possible to easily make gummy candy at home—no degree required! Some of the recipes weren’t flavorful enough and some didn’t quite have the right texture for me (if there’s not enough gelatin, it feels like eating a Jell-o jiggler rather than a gummy). But perseverance and many boxes of Jell-o later, I found a way that totally gets the job done. In a glass measuring cup, start with 2/3 cup cold water. Slowly pour in your unflavored gelatin while stirring briskly so the gelatin doesn’t clump together. Once the gelatin is poured, add your Jell-o packets while, again, continuing to stir the mixture. Boil some water in a pot. Bring the water down to a simmer and place the glass measuring cup in the water. I found that it was really easy to burn the mixture when it was poured directly into a pan, so doing it this way protects the mixture and allows it to heat up slowly. Let the mixture warm and thin out over about 5 minutes (stirring often) until it’s much thinner and more liquid-y (it should be more like a syrup). If the flavor of the Jell-o isn't intense enough for you, add a small Kool-Aid packet in a similar flavor when you add the Jell-o to the mixture. Keep the gummies in an airtight container in the fridge and they should last for up to a week. omnomnom! that legit looks delicious. now, i’d just have to figure out how to duplicate the sourness and i’d be able to replace my addiction to sour gummy worms with something homemade. AHH!! Wait…it doesn’t have the Jell-O texture, does it? It really tastes like gummy candy? My boyfriend is plum crazy about gummy candy so I really want to do this for our two year anniversary coming up!! This is soo coool! Let me know just because I want to make this!! That looks so cool! Perfect party snack to impress guests! This is just so clever. There are so many shapes you could try. I wonder if there is any way to make a vegetarian version also. This is awesome. Did not know it was possible to make candy out of Jelly! I’m a bit put off using gelatin recently though. Love this! And i’m sure it’s so much better for you than anything that is bought – also, your manicure is hilarious! I’m definitely a gummy feind! Thanks for the great recipe, can’t wait to try it out. You can also do it with fruit purees and fruit juice (sweetened with a little honey)for a little healthier treat. My kids love them! 1/2 cup fruit puree, 1/2 cup fruit juice, 3 packets Knox and a little honey. If you use less gelatin than stated it is more like a jell-o jiggler texture, but I liked this recipe because they came out more like a true gummy texture than the other ones I tried. I would give it a shot! Confectionary heaven, this is so cute! So awesome! It never occurred to me that you could make your own gummies. I can’t wait to try it! I love these! They turned out SO great! Laura, I think I love gummy candy more than your husband 🙂 So, thanks for this recipe. I wonder, could I incorporate fruits like mango or peach (instead of Kool Aid) into this recipe. If so, how? Love this idea! Wonder what would happen if we added vodka… would that ruin the consistency? You could probably just replace the gelatin with agar powder. This looks super easy! I’ll have to give it a go soon. Sooo much fun the possibilities are endless! Omg! Going to make this for sure! Super cute for the kiddos! Letters, numbers, animal shapes ~ fun and yummy learning tool! shall be trying this for sure! Hmm, I don’t know! Adding more liquid should be fine if you adjust the gelatin to a bit more, but I don’t know if the alcohol would change it. Try it! I thought to guys are vegetarian, surprised that you are using gelatin? I am so trying this. I’ve got a few Jello packages in my kitchen that I don’t use and have no idea what to do with. Now I do! That’s another really good way to turn a sweet snack into something you really know “ingredient”-wise. I was wondering this same thing! This is so fun! I love the idea of customizing a message for a birthday or special event! I have been wanting to try making gummies. I really appreciate your tips! These should be called Gummerman candies. Will using flavored gelatin affect it? I’m so excited to try this!